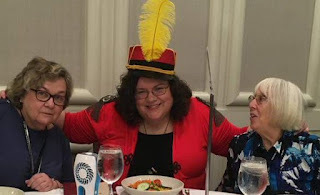 Conferences and conventions for writers are fantastic opportunities to network, catch up with friends in the industry, interact with readers...and hopefully tempt new ones to pick up your books. And since my day to post falls on my first day back, here's my post-conference agenda. 3. Clean DVR. My brain is mush anyway. 4. Eat real, healthy food. 6. Unpack the Amazon boxes that came when I was gone. Oops. 7. Say the minimum words possible. I am soooo tired of talking. 8. Ruminate on the things I learned. 9. Try to forget those embarrassing moments that happen when you have to keep talking and your brain is mush, such as introducing someone with the wrong name. Oh, and not only dropping grated carrots down your cleavage at the swanky awards banquet, but taking care to announce to the whole table that you just dropped grated carrots down your cleavage. 10. Scan Facebook to see all the pictures from everyone that was there, and catch up with what happened while I was gone. 11. Catch up on my email. Or try to, anyway. Lost cause. 12. Open the page proofs that arrived just before I left. I might not work on them today because of that whole mushy brain thing, but opening them seems doable. 13. Nap. Yes, a nap sounds lovely. Maybe I'll start with that. Oh, and news! 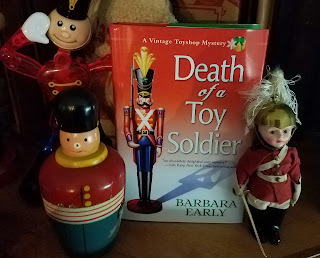 Death of a Toy Soldier was nominated for the David Award, given out at the Deadly Ink conference. Congratulations on the award nomination, Barb! And surviving a conference! I believe you are due for a four days of pajamas week. Congratulations on the nomination, Barb! Well-deserved. I am so happy for you! Excellent report. Enjoy your pajama day. I love the pic of you in the toy soldier outfit. Precious! And you are so comical. Love the report.